Paying off the decedent’s debts is one of the primary duties of an estate’s executor or administrator. Failing to do this can lead to personal liability on the executor or administrator’s part. The estate’s creditors have rights under Texas probate law, but all are time-sensitive. If estate assets are limited, whether the creditor receives reimbursement depends on the nature of the debt. A mechanic’s lien is an encumbrance on a property owner’s real estate title, used to guarantee payment to builders, contractors, and construction businesses which build or repair structures, by using the property where the work was completed as a form of collateral. Eligible parties include the general contractor, subcontractors, laborers, and material or equipment suppliers, as well as by architects, engineers, and surveyors. Material or equipment suppliers must have the materials actually delivered to or used in the project to claim a lien, but if the materials were specially manufactured, the supplier can get a lien even if the materials are not ultimately delivered or incorporated into the project. The lien ensures that the workmen are paid before anyone else if the property subject to the lien is eventually foreclosed upon. 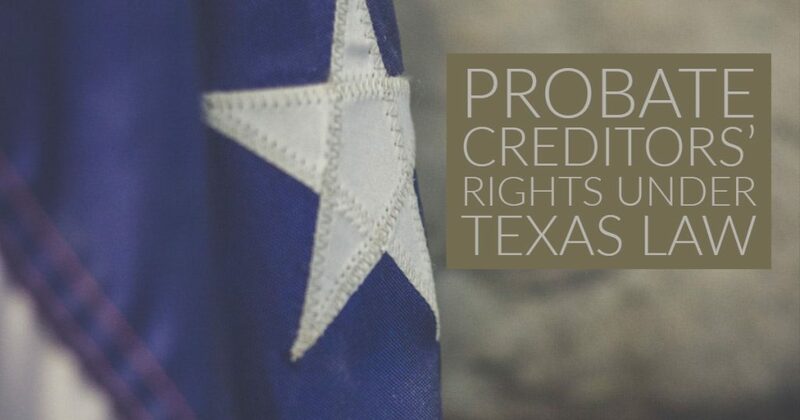 Non-judicial foreclosures in Texas are governed by Chapter 51 of the Texas Property Code, which outlines the foreclosure process for residential property, or the property used by borrowers as their principal residence . Foreclosures of non-residential property follow different procedures.